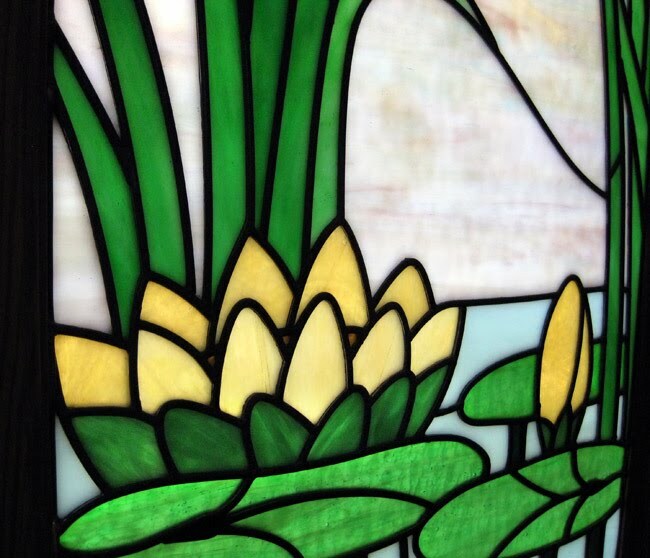 Today I have the third and final installment of my stained glass window building project! Last time we left off with cutting glass (check it out here) and now we are ready to build, solder and cement. The first thing you’ll need (aside from a cut window) is lead, lots of it. 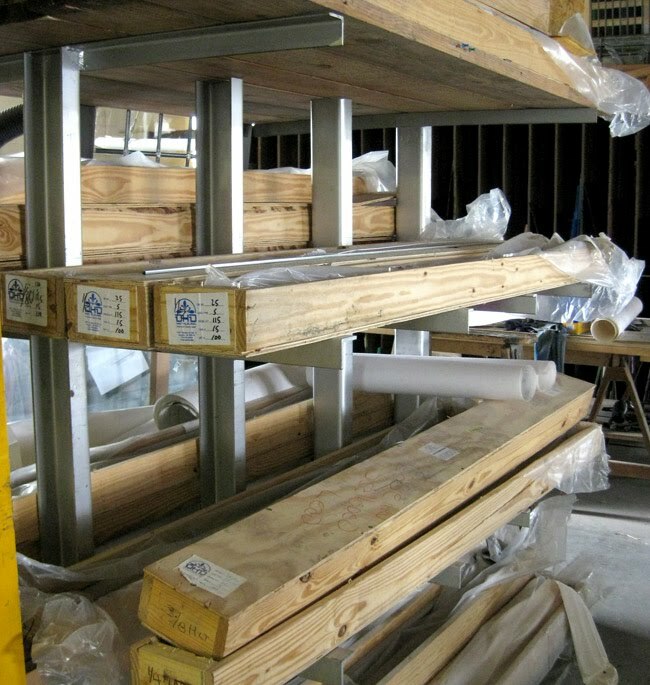 It comes in a variety of widths, six foot lengths and 110lb boxes. The lead has a heart (the center) and a leaf on either side. It’s shaped like an H, or an I beam, and the glass fits into the groove and sits up against the heart. 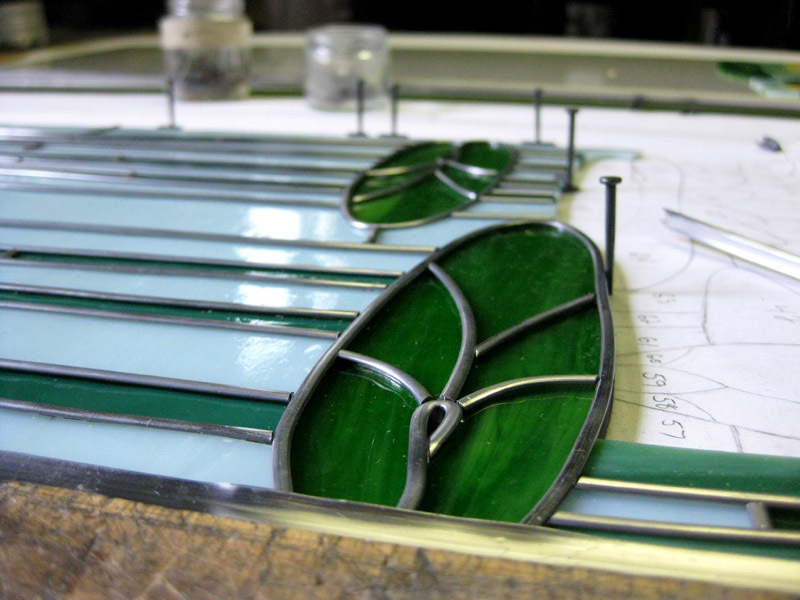 For this project I am using a 3/8″ flat lead for the perimeter of the window and 1/8″ round lead for the interior. Above you can see the size difference between the two. 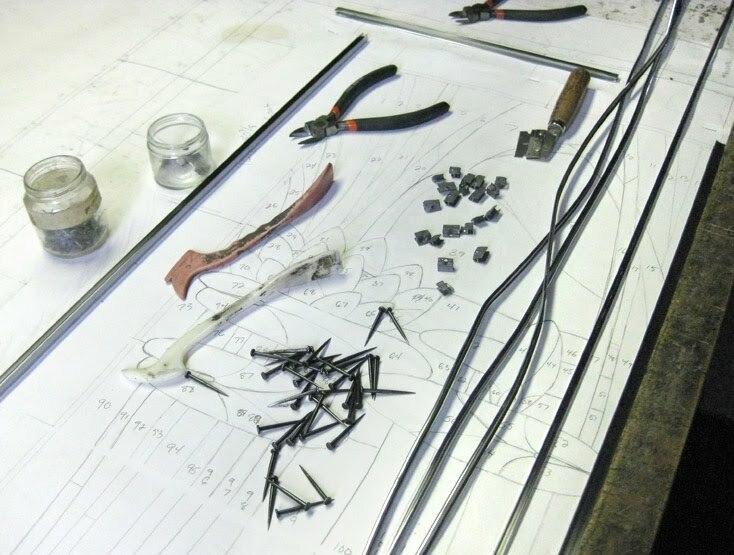 The size of perimeter lead that you choose is determined by the size of the rabbit (the cut out for the glass) in the wood frame you will be using. You need the lead to fill the space and extend out a small amount. The size of lead used for the interior is determined by the intricacy of the design, as well as aesthetic preference. 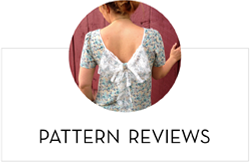 I love the look of a thin lead line for a design like mine and 1/8″ lead is the thinnest it comes. 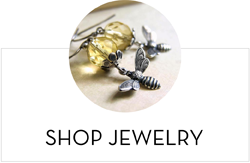 This, however, means there is little room for error or imperfection when building because you have less than 1/16″ of lead to overlap each piece of glass. Other tools needed are a vice, pliers, nails, lathekins, a small tack hammer and lead nippers, razor blades or a glazing knife. The first thing you need to do is stretch the lead using a vice to hold one end and a pair of pliers to yank on the other. This takes the kinks out and makes it more rigid. Above you can see a piece of lead on the right that has been stretched and three pieces next to it that haven’t. You build the window on top of your original cartoon, using it as a guide. 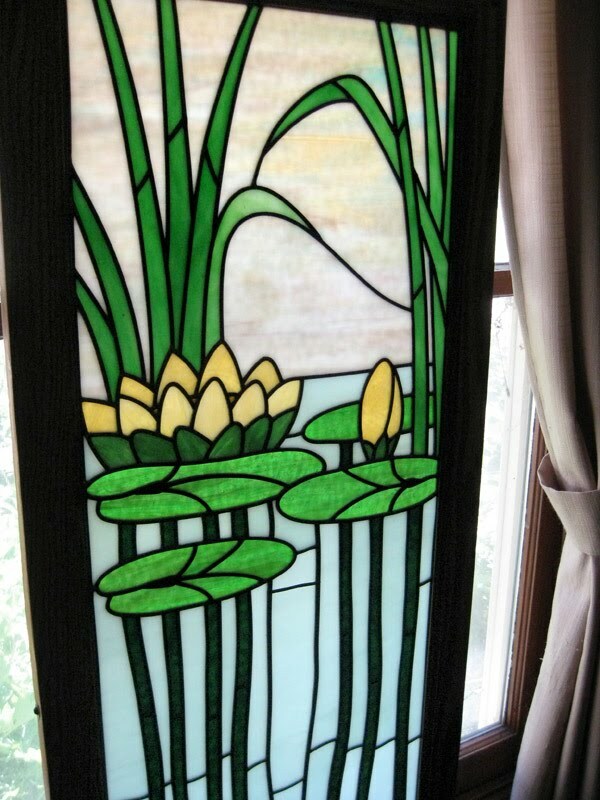 Because this window is rectangular, it’s built out of a squared corner. You first lay down two pieces of perimeter lead, tucking one into the other in the corner, and begin building out from there. 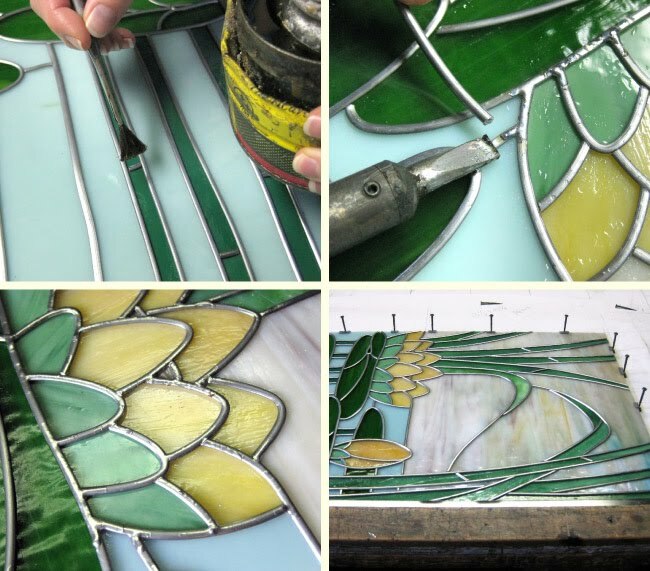 Laying down one piece of glass at time, you hold it in place using small nails. A piece of lead is used in between each piece of glass. 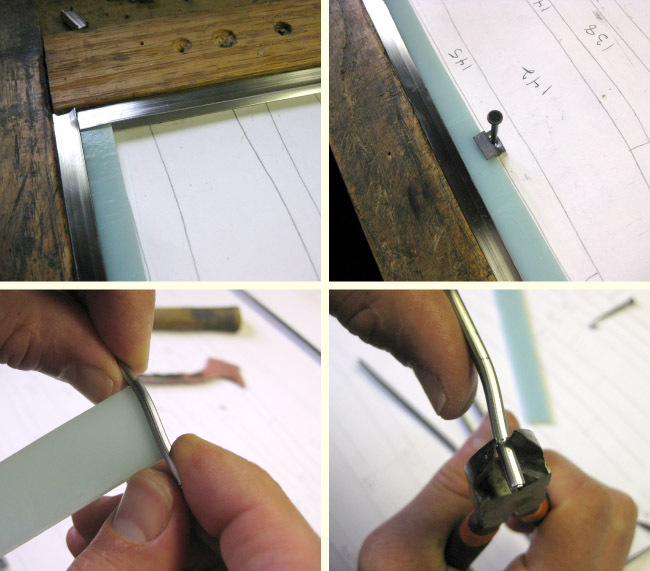 You first bend and form the lead to the glass, then mark the length and trim to size with lead nippers or a knife. 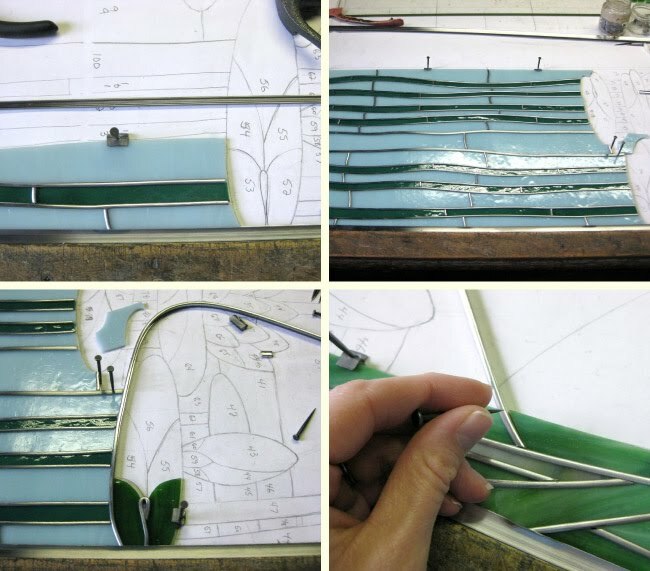 This process continues until you run out of pieces and then you finish by putting the remaining two pieces of perimeter lead around the outside. 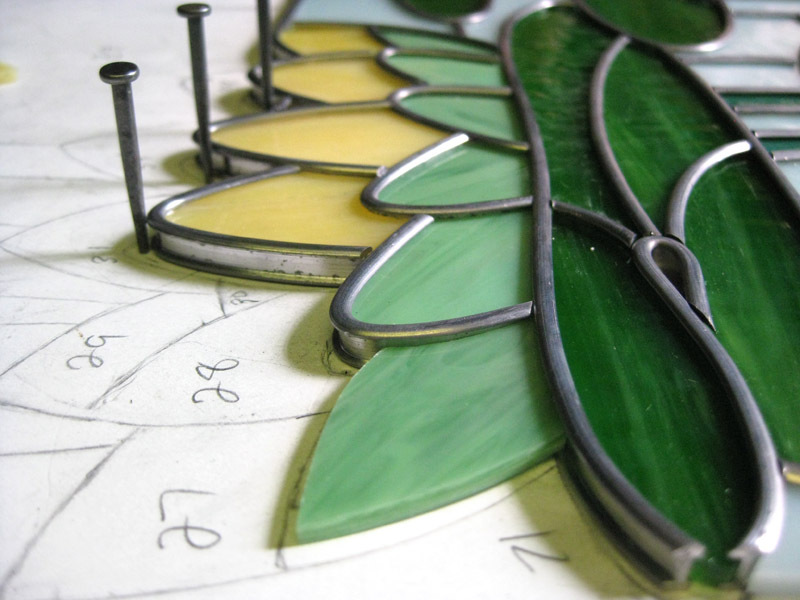 Check to make sure the piece still matches the final size and now you’re ready to solder. A 60/40 solder is used for lead, it is 60% tin and 40% lead. It flows smooth, polishes well and produces a cleaner joint compared to 50/50 solder which melts more pasty. The soldering iron is plugged into a rheostat which controls the wattage (and heat output) going to the iron. If your iron is too hot, you can melt away the lead. In preparing to solder, you first brush the joints with oleic acid, which is a flux used for lead soldering. The flux removes oxidation, seals out air preventing further oxidation and facilitates amalgamation allowing the solder to flow easily rather than forming beads as it would otherwise. With the soldering iron in one hand and a length of solder in the other, you touch the tip of the iron to the solder then apply it to the lead, covering the joints and smoothing it out between them to join all the pieces of lead. When one side is complete, you wipe off the excess flux, flip the piece over and solder the back side. Now it’s time for the final step of construction, cementing. 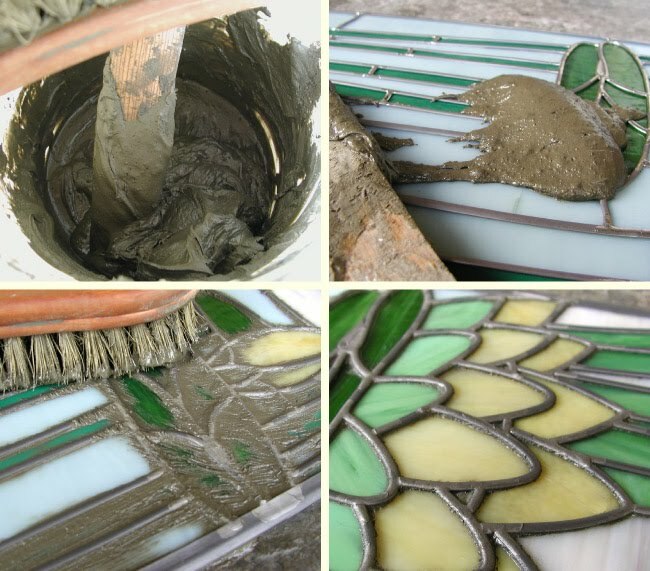 Cementing will waterproof and solidify your window. Essentially you are cramming a bunch of gunk in between the lead and the glass which then hardens. There are commercial cement mixes available but they mix their own at the studio. Don’t even bother asking what’s in it – it’s a shop secret. All I know is it stinks. 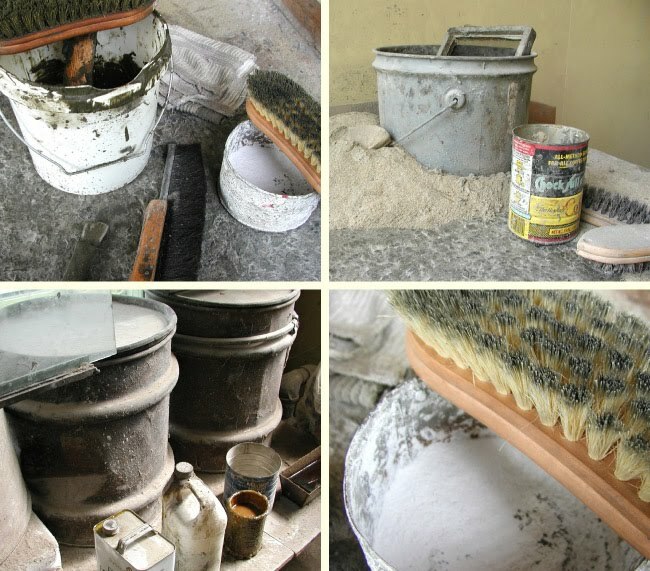 Once the cement is mixed, you glop it on the window and begin spreading it out, pushing it into the lead with a natural, soft bristle brush. 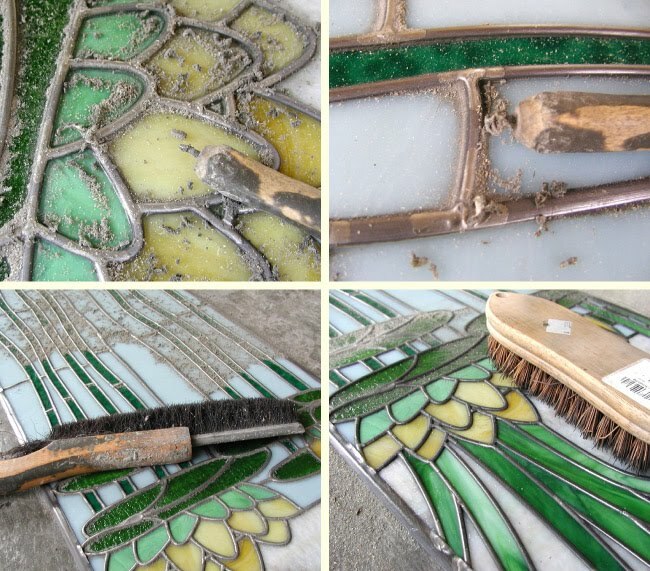 Once you cover the entire window, you brush off as much excess as you can, scraping it back into the cement bucket. The next step is to sprinkle whiting and fine sawdust on the window. Whiting is calcium carbonate which, in conjunction with the sawdust, helps to draw the oils out of the cement. It also buffs the lead and the glass. 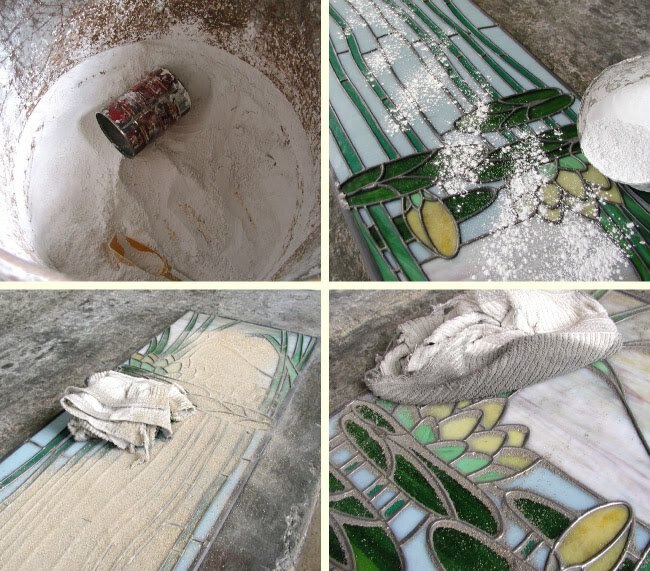 You wipe the powder and sawdust around the window with a rag, scrubbing off some of the excess cement and cleaning the oils off the lead and glass. At this stage, you flip the window over and repeat these steps on the back side. Once both sides are done, you go back to the front side and using a small pick (such as an old dart), you scrape along all the edges of the lead, removing excess cement. It’s about this time that you should be thinking to yourself, ‘damn, that looks tedious.’ Yeah, it is. You then brush off all the pickins and with a hard natural fiber brush, you take off what the pick didn’t. 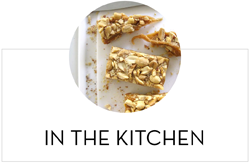 You then sprinkle the window with more whiting and sawdust, flip the window back over and repeat the process on the back side. You continue this, going back and forth, until the cement stops oozing out from between the glass and the lead. See, tedious. 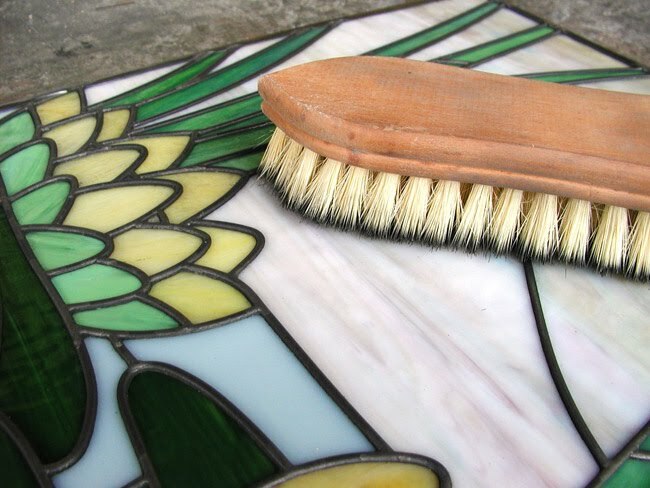 When you see no more cement leaking out, the final step is to polish the lead and glass with a clean, soft, natural bristle brush. Using a brisk brushing motion, you darken and oxidize the lead and solder to a uniform, dark pewter color. The window is now ready for installation. So,who’s thinking ‘this is way too much work for me!’? It is a long tedious process but I think you’ll agree, the outcome is well worth the time and energy put into it. 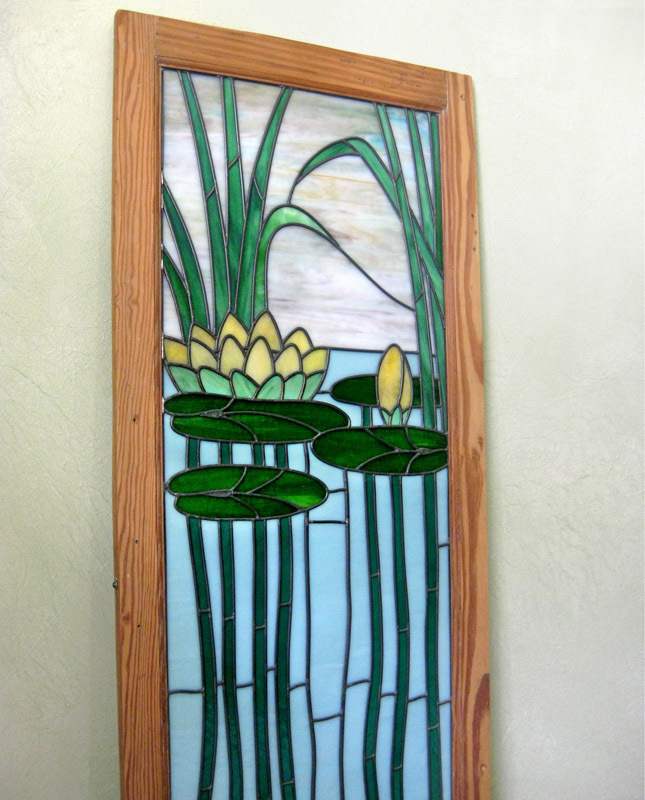 I didn’t create this piece to fit into a specified window or space, but rather just to take advantage of my chance to use the shop before it closes and create one more piece to treasure. I built it to fit into an old cabinet frame that was in the attic of the shop. For now I hope to find a spot to keep it in my new workspace and then in the future I can hang it as is in window, on a wall, build a lightbox for it or even put it into a new frame or window opening in the house. I hope you’ve enjoyed learning more about this classic art form and maybe found a little inspiration along the way. Even if you never get to dabble with this medium yourself, at least you can say you know how it’s done. And as G.I. Joe so wisely said, knowing is half the battle. That is simply stunning! I have been looking forward to your final post on this project since I saw your first two posts on One Pretty Thing. I love it! oh WOW!!! what a fabulous piece & reminder! So beautiful. I think even more so because we now understand the process that went into it. The explanations were fabulous. Stunning result! It's WORTH the hard work for sure. I love the shade of green that you chose. What a beautiful piece of work, Nicole! 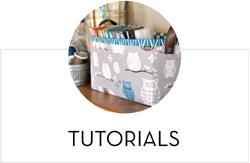 An inspiration for sure and perfect for your workspace….lovely! So beautiful! And great pics and explanations to go with it! Thanks! oh and wow – all my hats off! 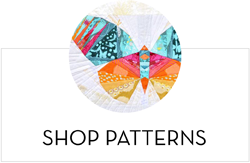 you made a really beautiful piece – and I am sure it will have a great palace in your house! 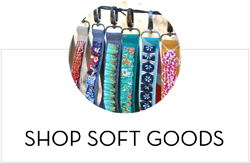 Hey that looks great! Good job! Well written too. It's beautiful and the process so fascinating! Thanks for sharing.